MY INFOLINE is an Online Business Directory,Local Search Engine, Digital Business Pages. our membership packages that are designed to boost your online business through our Online Business Directory and digital web pages designed by us which would be promoted on search engines. 1. Online Brand Building: We promote your company along with your company profile. 2. Business Generation: myinfoline.com offers a platform to advertise your products and services and get maximum inquiries for your business. We forward these inquiries to you through SMS and E-mail so that you can directly reach your prospective clients. 3. Customer Feedback: Here at myinfoline we facilitate your customers to share their experiences and feed-backs with the world. And hence they can rate your brand and services that will help to enhance your business credibility. 4. 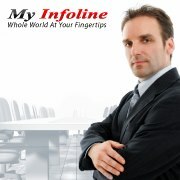 Online Exposure: Your all products will be displayed on your own webpage (www.myinfoline.com/yourcompanyname) which will be designed by us. 5. Customer Support: During your membership tenure a dedicated support executive will support you to maximally utilize all the services available in membership.